William John Rainey was the son of George and Mary Rainey. Robert was born about 1885 in Ermgal, Ballygawley, Co. Tyrone. William John Rainey was a member of the Royal Irish Constabulary before enlisting. 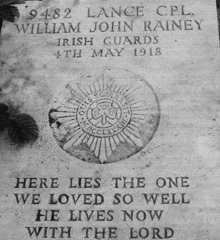 Lance Corporal William John Rainey was serving with the 2nd Battalion of the Irish Guards when he was died on 4th May 1918. Lance Corporal Rainey was 33 years old. 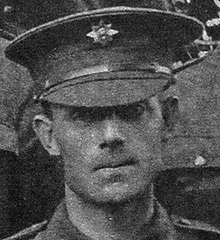 Lance Corporal William Rainey was one of three soldier sons. William George and Robert Rainey were killed and the third was discharged on account of wounds. 3 RIC in the Great War Lists William John Rainey as casualty.